These are inland design. In the early days, people from inland would come down and trade with the coastal people, [exchanging] clothing that they had made . . . for seal oil, seal blubber and coastal foods. Wild mountain sheep are available in the Brooks Range of northern Alaska, but not along the arctic coast. Inland Iñupiaq people traded sheepskin clothing and hides for the products of coastal villages. Ron Brower, Sr.: These [uppers] are made out of sheepskin and the legs of a sheep. And these are inland design. In the early days, people from inland would come down and trade with the coastal people, [exchanging] clothing that they had made in the interior for seal oil, seal blubber and coastal foods. Trade through barter and trade for this kind of clothing. Jane Brower: They’re not made by people from Barrow. Karen Brewster: Do you know what are the soles made out of? Jane Brower: Marra manna naluaguŋitkaluaqpa? Kenneth Toovak: I think they’re really young baby seal. Jane Brower: Uŋuqugu atuŋaŋaruq ixuaniñ. Jane Brower: Ugruayaaq qanuġmarra. Miqupiaqługuasi marra atuŋaŋaruq. Ron Brower, Sr.: These are made from young bearded seal. And this is from seal that’s been prepared for winter clothing. Kenneth Toovak: Kamŋusuŋnaqtut Nunamiut kamisuŋnaŋit marra uqpikugni igluqaqtuat [they are boots and are probably Inlanders’ boots where there are bushes and dwellings there]. (1) These soles were different designs, so when they’re walking they would do better in the brush. Maybe that’s why their designs are a different shape than what we have. Ron Brower, Sr.: Yes, this [sole] design goes up higher. The thought behind that is that when you’re walking through bushes and willows, then you’re not likely to snag as compared to our traditional coastal style of boots, which have a narrow crease down here [edge of boot sole], which were primarily for walking on ice and snow. Those inland, they’re walking though hills, bushes and willows, and so their design is different from the coastal side. 1. According to Iñupiaq Elder Martha Aiken, Nunamiut is a name for inland Iñupiat. In the Barrow area, mountain sheep skin from the interior was sometimes used to make winter dress boots. (1) According to John Murdoch, this pair of dress boots—collected by Lt. P. H. Ray in 1883—was brought back “from the east” (possibly the community at Demarcation Point) by a Barrow trading party. 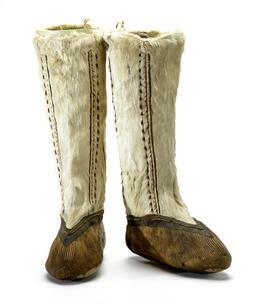 (2) Elders who examined the boots in 2002 identified the design as typical of the Nunamiut, or interior Iñupiaq.